Monday morning 22 May, aka Wave 3, was as big as we expected with well over 100 new summits on both sides of Everest. The weather remains good for most teams. The body of missing Indian climber was found taking the death toll to six on both sides in 2017. With a full week to go, I estimate well over 350 total summits on both sides and perhaps as many as 150 more to come. This is a rundown of the results. I apologize for not mentioning every name so click on the links to see them by team. Also, I try to mention the Sherpas when possible. I find it sad that some teams simply give the members names and not even mention the Sherpas. Great news just in from Dhaulagiri – the whole team summited at 5.25am! Congratulations to Claudia, Tom, Jon, Charlotte, Iza, Dhiren, and AC guides Guy Cotter, Dean Staples and Lydia Bradey. A huge congratulations goes to Jb Chandesris who submitted at 6.55am without supplementary oxygen! IMG had a good day with 27 on the summit including my dear friend Jim Davidson, There were 10 foreigners, 15 Sherpas and 2 guides. Also my 2011 fellow Everest teammate, Karim Marino Mella Nazir, return for another summit. IMG still has perhaps 20 more members positioned at C2 ready to summit. Madison Mountaineering put 7 on top very early – before sunrise. They assisted with a climber with frostbite costing some their team their summit. Well done. We are very proud to announce that Anshu Jamsenpa has just summited for the 5th time and for the second time this season. That is the first time that a woman has summited twice in one season on two separate occasions. Mountain Professionals helped Chris Bombardier with severe hemophilia summit. There were no major issue reported on the south side but there was talk of one “large” team that clogged up the route. Team summited Everest this morning, but not everybody. Some turned around due to heavy winds, but all are in good health.Everybody is descending to the North Col now and will probably spend the night there before reaching ABC. Rasmus delayed his self supported oxygenless attempt last night due to wind and will try again this evening. Transcend Adventures put more members on the summit from the north with 6 in total consisting of Teens:2 boys 2 girls and 2 adult women. Iowans for Everest got their summit around 4:30 am. I’ll try to get more from them in the future. Kilian’s speed run to the summit of Everest from the Rongbuk Monastery started at 6:00 pm Sunday night. It was expected to take 20-30 hours. The last report had Kilian at 7500 meters. Kilian Jornet reached the summit of Everest at midnight of 21st to 22nd May (local time) in a single climb without the help of oxygen or fixed ropes. He reached the summit via the north face of the world’s highest mountain (8,848m) following the traditional route. Kilian Jornet began the challenge at Everest Base Camp Base near the ancient Rombuk monastery (5,100m) on May 20 at 22h local time (+5:45 GMT). At 12h15 local time of May 22nd he is back in the Advanced Base Camp (6,500m) where he confirmed summiting Everest at midnight, 26 hours after beginning the ascent. 38 hours after starting the temptative, he has arrived to the Advanced Base Camp of Everest, he explained: “Until I reached 7.700m I felt good and was going according to my planning, but there I started to feel stomachache, I guess due to an estomach virus. From there I have moved slowly and stopping every few steps to recover. However, I made it to the summit at midnight”. Due to this indisposition, Kilian Jornet choses to conclude the attempt, and stay in the Advanced Base Camp and not returning to the Rongbuk as planned. Once we have more information about the challenge, we will inform through the channels of Summits of My Life. first Polish solo Everest Traverse without O’s by Janusz Adamski (summit on 21st), Descended safely to camp 3 on summit day. But not everyone has had a good weekend. The Himalayan Times reports that five climbers were helicoptered from as high as Camp 2 on the Nepal side suffering from altitude related illness. This is in addition to the three deaths and one missing climber that occurred over the weekend. The body of an Indian climber was spotted on Mount Everest on Monday, after he went missing two days ago while descending from the world’s highest peak. Sherpa rescuers spotted the body of Indian climber Ravi Kumar, but it was impossible to retrieve the body, said Thupden Sherpa of Arun Treks and Expedition. It appeared that Kumar had fallen some 200 meters (650 feet) below the route, he said. Another 7 bottles of Os have gone missing from our supply – this time from The South Col. Given what’s been unfolding over the last couple of days with failed summit bids and fatalities it doesn’t surprise me …. but I do wish people would let us know. No one in their right mind would withhold previous oxygen from any team / climber having difficulties. But if those difficulties are as a result of their own oversight or lack of sufficient supply it’s a difficult situation to reconcile – especially when it potentially affects the success or otherwise of our own team. Indeed, as I’ve mentioned before, lack of sufficient oxygen can easily develop in to a life threatening situation. Thankfully Pemba, having summited Lhotse yesterday, had enough energy to go to The South Col and check our supply and report his findings. BUT … will it still be there when we arrive in a few days or will a few more bottles of magic air have gone missing? For the past 22 years, I have been on a major climb (or 8!) every year. As most readers know by now, my “incident” in February kept me at home instead of climbing Dhaulagiri. So I’m having a good time on my 15th year covering all things Everest. I spent Sunday afternoon at the home of absent Jim Davidson with his family watching the Dot on the computer. 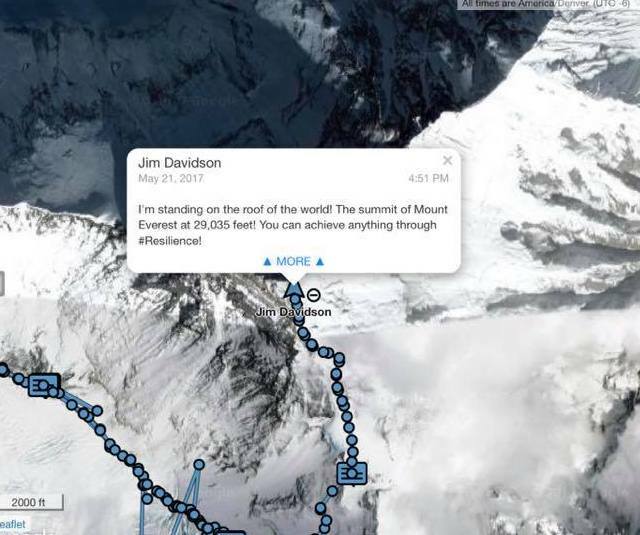 The dot was Jim edging ever higher towards his lifelong goal to summit Mt. Everest. It was quite the switch for me being on the other side of the screen! The atmosphere was festive, and positive. We channeled all our energy to Mt. Everest, focused on the precise spot that Jim occupied. My mind went back to my own summit climb exactly 6 years and one day earlier. I could close my eyes and remember each step like it was yesterday. My closing line often is “Memories are Everything”. Today I was grateful for my memory of climbing Everest as I could help decode the vagaries of the distance between the Balcony and the South Summit, why the “Dot” seemed to stop, how much longer it might take and exactly where is the summit on that Garmin InReach map? There were many things I couldn’t answer like what was Jim thinking, how was he feeling, would he climb another 8000 meter mountain? We talked about these and everyone had their view. But we always had one eye on the Dot. 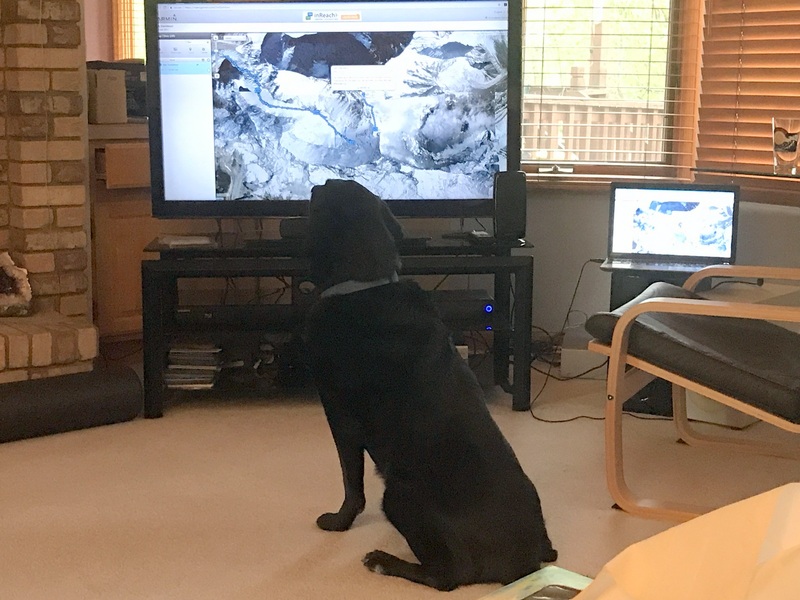 Jim’s son connected his laptop to the TV so we could watch together as Jim reached the South Summit. We followed closely as he ascended the Hillary Step and got even closer as he approached the summit. Frustratingly, the Dot didn’t refresh often enough at times, leaving the eager audience wanting and occasionally wandering off to the kitchen for another beverage. When it looked like he had made it, we all paused, waiting for the refresh. In this age of real-time communications, we would not celebrate, or take a deep breath, until we got the notification. And then it appeared! With a huge cheer, big smiles and lots of hugs, the celebration began with a champagne toast. I often write about how it’s sometimes tougher for those left at home. I know during my climbs, my family and friends kept the vigil strong, sent me positive energy and watched my ‘dot’. On K2, when I stopped just below the summit, developing pulmonary oedema, I was ready to abdicate to the mountain, sit down in the snow and stay for eternity. It was the thought of those who loved me, followed me, believed in me, supported me that fueled a breath of life back into my dying body. It was that love, fueled by that dot that allowed me to sit in Jim’s living room, sending him that same love and energy. I am so proud of my friend. I watched him learn, study and train for years. I watched him take the tragedy of losing his climbing partner on Rainier and make it a positive. He transformed the disappointment of turning back on Everest after the 2015 earthquake into motivation and lessons to train smarter and harder than he ever had for a mountain climb. Today, I was an observer of a real climber. Jim’s endless energy, focused work ethic and generous spirit served him well. He summited in good time and returned to the South Col on his way to Camp 2, base camp and home.